Paphos is a calm relaxing coastal city in the southwest of Cyprus with two main sections which includes Kato Paphos, home to archaeological sites as well as an abundance of hotels, bars and restaurants. Paphos property has drawn home owners from around the globe with many from the UK, Russia and China. International property owners and tourists enjoy the beachfront alongside the excellent transportation system with Cyprus newest mall just minutes away. Located in the region of Paphos are many villages that boast spectacular sea views. This beautiful 3 bedroom villa with the highest standards is set in one of the most desirable locations of Paphos. Located in a large plot with private garden all around and large space for a swimming pool. This beautiful 6 bedroom villa with the highest standards is set in one of the most desirable locations of Paphos. Located in a large plot with private garden all around and large space for a swimming pool. Luxury 2 bedroom Villa is centrally located, minutes from the sea and fantastic view. This property will be ready for delivery in 12 months. This amazing 3 bedroom 4 bathrooms Villa with nice sea views is located in the located on a gently sloping hillside on the outskrits of Paphos. Luxury 2 bedroom Villa is centrally located, minutes from the sea and fantastic view is now available for sale. This property features under floor heating, marble vanity tops, kitchen granite tops. This luxury 4 bedroom villa is on the frontline beachfront of Coral Bay with breathtaking view of the sea and surrounding unspoilt nature all around. This 4 bedroom 4 bathroom luxury villa is located in Coral Bay area, one of the most exclusive areas in Paphos. Some of its features are the under floor heating, italian kitchen, upgrated finishes and much more. This 4 bedroom, 4 bathroom luxury villa is located in the post prestigious area of Paphos. The contemporary architecture of this villa and the luxury finishes are ideal for a luxury waterside living. This modern 3 bedroom villa is a freehold property with comfortable living and dining area, contemporary architecture and is perfect for luxury waterside living. A 5 Bedroom beachfront villa is located in the most prestigious area of Paphos in a large plot area. This luxury villa consists 5 bathrooms, underfloor heating, private gardens, marble flooring and upgraded finishes. This exclusive property is a 3 bedroom 2 storey villa on a very large plot of land with fantastic sea views. It has a large and spacious living area, swimming pool and roof terance and optional BBQ and Jacuzzi. This exclusive property is a 3 bedroom 2 bathrooms villa with great sea views. It has a large and spacious living room, swimming pool and roof terance and optional BBQ and Jacuzzi. Situated close to the famous archaeological site 'THE TOMBS OF THE KINGS' and within walking distance from the beach, night life, restaurants and tavernas. Leptos Kings Court is located on a gently sloping hillside overlooking the sea. Situated close to the famous archaeological site 'THE TOMBS OF THE KINGS' and within walking distance from the beach, night life, restaurants and tavernas. One bedroom Apartment available for Sale in Leptos Mandria Gardens with direct access to the beautiful setting of communal pool area. The added value to this property is the direct access to its private garden. This 1 bedroom Apartment in Mandria Gardens located close to Paphos town centre and has a great investment potential for its location,the quality materials and having great views to the sea and the swimming pool. This 1 bedroom Apartment in Mandria Gardens is located close to Paphos town centre and has a great investment potential for its location, quality materials and having great views to the sea and the swimming pool. This 2 bedroom Apartment is surrounded by the green areas. This Apartment offers great size, privacy and then again great value for investment. Peyia Hills offer an exclusive address with prime investment potential. 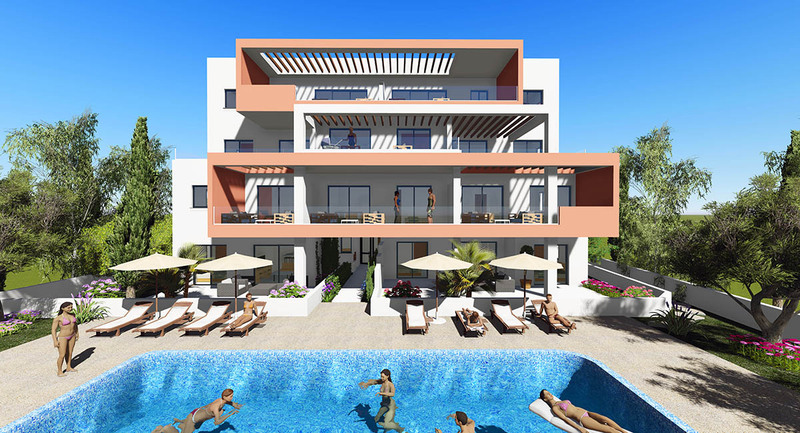 These are resort residences and elegantly located in the fertile hills of the traditional village of Peyia just a few minutes away from the blue flag sandy beaches of Coral Bay. This exquisite 3 bedroom villa offers exceptional living and entertaining space with an open plan living/dining area. The accomodation is set over 2 floors and offers the master bedroom ensuite alongside a dressing room.